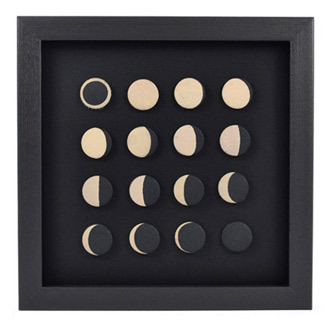 Phases of the Moon is an edition of 50 framed sets of moon phase lapel pins. Each set is accompanied by a digital widget that displays the current lunar phase and it's corresponding pin. The fabric pins were created by applying discharge ink - which removes dye rather than adding ink - and the backing is printed with a placeholder image of each pin. The frame is designed to be rotated at every full and new moon. Artist Bio: Helena Keeffe has developed an art practice based in situations and exchanges, inviting others to engage in a participatory experience and encouraging vulnerability and intimacy where one might otherwise expect a formal authority. Her work typically involves repurposing a familiar format and disrupting the expectations of the viewer. Many of her projects explore ideas of generosity and economics of exchange that function outside standard monetary models. Her projects are inspired by and deal with real-life situations, often celebrating or bringing to light aspects of urban environments that are normally overlooked.